Oleksandr Usyk and Tony Bellew made weight ahead of their mammoth cruiserweight fight in Manchester. Undisputed world champion Usyk travelled to the United Kingdom to welcome the challenge of Bellew, who has promised to shock the overwhelming favourite. 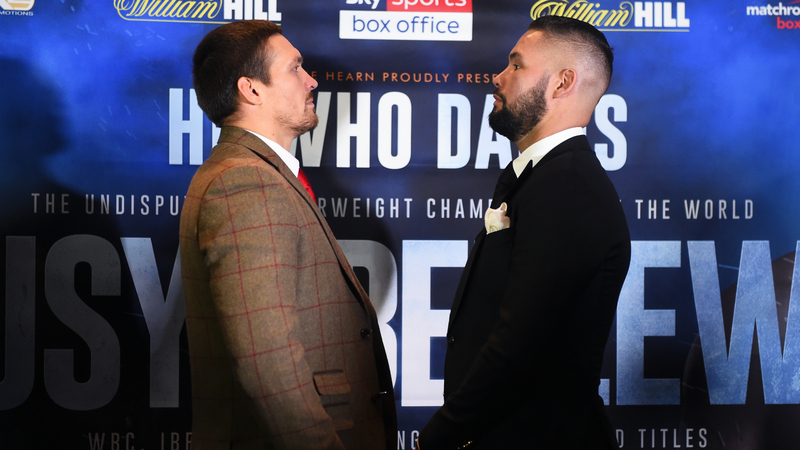 And Bellew, looking in great shape, weighed in at 14 stone 3 pounds on Friday – 11lbs shy of his last fight against David Haye at heavyweight - while Usyk was a pound lighter. Having made the fight, the two went head-to-head for a final time on the stage, Usyk sporting a Manchester City scarf around his face in the week of the Manchester derby. "I feel fantastic. Fat boy is in shape," Bellew told Sky Sports. "I made weight. I told everyone I would. "I'm ready for war. I told him: be ready for war because that's what this is. There can be no peace until there is war. I am going to war, believe me. "He's in the deep end. I know exactly where I'm at - I've experienced everything in this game - it's going to show. I cannot wait." "He's a formidable, fantastic champion," he said of Usyk, before adding: "I will be crowned the king of the world."